Introducing our new Translation Tools! This advanced system gives subscribers who are interested in the translation of Chinese language or in dynastic Chinese texts a serious helping hand with their own translations. Name and describe your document. 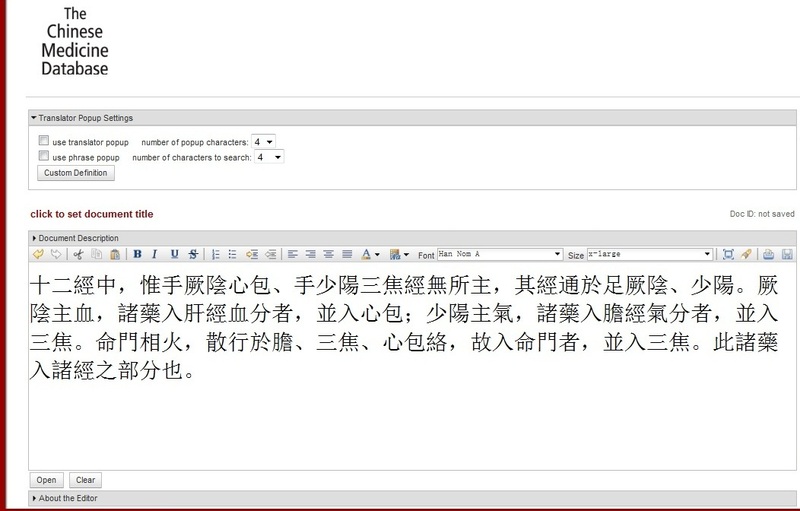 Enter your own Traditional Chinese text on the Translation Tool page. Our system can handle thousands of pages worth of text in each document. Save your document on our server, and work on it from anywhere regardless of what computer you have in front of you. By character/ character set or by phrase. Or you can choose to have both popups going at once. This popup has been designed to work with a small number of 1 to 8 characters. It uses "smart technology", so it will show you any characters that are matched in our dictionary that match words in your text. For example: take the phrase bù bì fēng hán 不避風寒. The popup will recognize 不 as it's own word, and then see if there is a match for 不避, and then a match for 不避風, and then 不避風寒, up to 8 characters ahead of the character that you are hovering on. This "smart technology" will help you see the multiple combinations of the words on the page at an incredible rate. For characters that have multiple instances a number above the Chinese character documents each different instance of that character. By hovering over the number, you can see the different usages and definitions for a single character. This popup compares a set number of characters against all of the possible lines of text (both translated and not) that we currently have in the Database. Thus providing not only an excellent tool to check your own translation, but also to cross-reference a quote against 100's of other line instances. Use our Character search tool to look for and find rare and hard to find characters. Characters are organized by radical and stroke number for convenience. Of course what kind of tool would this be if you couldn't save your own definitions. Save your private custom terms in sets of up to 8 characters or in whole paragraphs. See multiple dictionaries in our popup including: The Eastland termset, The WHO term set, a Chinese-English dictionary, and the CM-DB dictionary (our terms come from the books and online translations which we have published. Using our own documents to create a cohesive term list makes the most sense, since we are actively engaged in translating a wide variety of literature from different Chinese dynasties. All of our own terms are cited by source and author, so that the subscriber can see who made the translation, and in what book it came out of. Our dictionary is updated regularly with the release of each new book, so our house dictionary is constantly growing by leaps and bounds. We currently are drawing from over 105,000 words. Subscribers who choose the Translation Tool customization (add on) also have access to all of these great features while viewing the texts that we have translated and are searchable as part of our online database. The Translation Tool was four years in the making, and we think that you will agree with us, that it is indispenable for the scholar and student who is working with the Chinese language.